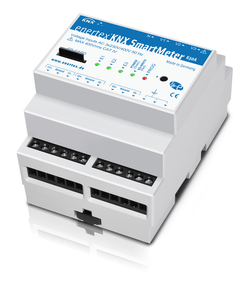 The KNX SmartMeter (4 SU) is a bidirectional meter for measurement of active and reactive energy and for monitoring power supply quality. Calibrated current sensors supplied enable measurements with accuracy class 1 (1%). Can also be used without KNX bus, as a battery-buffered real-time clock is built in. When operating without KNX bus, all data with time stamp are recorded every minute on the SD card.